Exploring the heritage of "The Pearl of the Orient". Situated just off the coast of Malaysia in the Straits of Malacca, the island of Penang was for centuries a vital stopping-off point on the great East-West sea trade routes, linking Great Britain and Europe with the Malay archipelago and China, via the Middle East and the Indian subcontinent. Situated just off the coast of Malaysia in the Straits of Malacca, the island of Penang was for centuries a vital stopping-off point on the great East-West sea trade routes, linking Great Britain and Europe with the Malay archipelago and China, via the Middle East and the Indian subcontinent. These days, direct flights from abroad usually involve arriving late at night into the darkness of Penang’s capital, George Town. The warm, humid air is the first pleasure that greets its visitors and friendliness is abundant. As dawn breaks, the call to prayer drifts up from the mosques through the open windows and gently awakens you. Religious diversity and tolerance constitute one of the island’s greatest treasures and the harmonious intermingling of culinary, cultural and architectural traditions has brought recognition from UNESCO, with George Town being declared a World Heritage site in 2008. Installed in a meticulously restored original Malay shop-house in Church Street, the Penang Heritage Trust acts as something of a bulwark against the disappearance of traditional trades and living cultures, threatened by undesirable property development, inner city population decline and neglect of heritage assets. For a very reasonable fee you can become a member and find out about local Chinese, Indian and Malay arts and environment activities or take part in one of their heritage tours exploring the tastes, historical monuments and unique traditions of George Town. A recently launched PHT project jointly funded by the Malaysian government and the local university has taken the unusual approach of assisting artisans and performers whose skills are considered traditional, by setting up an apprenticeship programme to safeguard the city’s precious cultural heritage. Among the artisans involved are a signboard carver, a rattan weaver, a paper glass lantern maker, a hand-made jossticks maker, a kebaya tailor and a Koran calligrapher. The heritage trail can be taken any time with visits to the State Museum and State Art Gallery, temples, mosques and old Chinese houses. It is wonderful to explore the narrow streets and the beautifully tiled pre-war shop houses, many of which are still occupied by traditional artisans and tradesmen. The Nyonya Beaded shoe shop in Armenian Street is very special and here the dying art of beading survives. The Nyonya culture is a mix of Malay and Chinese traditions in costume, music, design and food. Incense and Bollywood music bring Penang’s Little India to life. It is fascinating to wander the streets amongst the flower and food stalls and the vibrant colours of India. It is always easy to find somewhere delicious to eat. In fact, eating in George Town can be a full-time occupation. Malaysians as well as foreigners head to Penang just to sample the unique selection of ethnic cuisine. Food carts are pedalled or pushed into street locations each day and an enormous variety of culinary specialities are prepared. 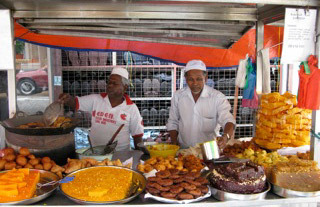 These food stalls have been passed down over generations and precious recipes perfected on the way. For just two Malaysian ringgit (equivalent to approximately 55 US cents) try the nasi lemak (egg, rice & sambal wrapped in banana leaf) which is available almost everywhere in Penang. It is unbelievably delicious! Other food stall delicacies include barbecued duck and the flat noodle dish Char Kway Teow filled with cockles, prawns, egg, bean shoots, soy and chilli. I end up craving for the spicy Assam Laksa, a sour fish-based noodle soup with fresh mint and pineapple. Sweet tastes include the refreshing Ice-Kachang – consisting of a pile of ice shavings, palm seeds, red beans and sweetcorn with various forms of jelly and syrup and topped with evaporated milk! Exploring the street hawker stalls is a delicious, cheap and local experience. There are many eating houses. Nyonya food is quite unique and there are a number of very good restaurants. One not to miss is the Hai Nan Town Penang near the port where you can try a great selection of Nyonya food while you look out over the water at passing ships. The Kapitan serves unbelievably delicious Indian food and is open 24 hours a day, so if you have a craving for Tandoori Chicken or Vegetable Biriyani in the middle of the night or day, this is the place! Seek out the Chinese teahouses that also serve a variety of very interesting dishes. Street markets open for business early every morning and while it is a great way to discover all the local produce, it is also where people chat and meet. You never feel alone in Penang. People are friendly and want to help, and everyone smiles. One day in a taxi my driver saw the uncommon sight of an old man lying in the hot sun on the side of the road. He stopped to make sure someone was looking after him and then called the welfare services to make sure he was cared for. On the last Sunday of each month a street fair is held in Upper Penang Road. This is a market selling antiques and charity crafts with music and even some book readings held on the side. It is the place to wander, chat with people and generally feel at home in Penang. Festivals and markets are all part of the fun, and with the many cultures there is always something going on. 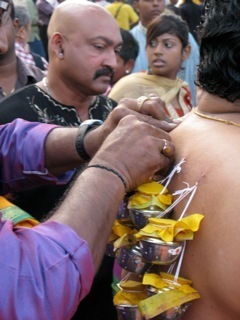 Thaipussam is a major Hindu festival held in February. Young men prepare for their part in it by fasting and sleeping on hard floors for a month. When the great day comes, they allow hooks to be threaded through their skin. Oblivious to the pain and with no bleeding, they drag large floats, chained to the hooks, through the streets to the Hindu temple. This extraordinary event goes on for a full day, free vegetarian Indian food is abundant, and the streets are filled with the spectacle of colours, beating drums and carnival. 850 -meter-high Penang Hill is the backdrop to George Town and was the cool retreat for the early British colonists. Somehow building materials were transported up the hill to build British-style homes on the steep slope in the thick tropical jungle. A funicular railway now takes you up and the views are spectacular over the capital and the Malacca Straits. A British restaurant that occasionally may even serve Yorkshire Pudding is located at the top, in colonial heritage surroundings. Captain Francis Light of the East India Company and founder of the British Colony in Penang grew strawberries on the hill in the 18th century. Accommodation in George Town comes in a range of styles. Built in 1884, the elegant Colonial-style Eastern & Oriental (E&O) Hotel on the beachfront in George Town once accommodated famous writers and artists attracted to the exotic East, while good central accomodation at very reasonable prices can be found at the Traders Hotel which offers special benefits to those who join the Traders Club. This extra service includes a venue looking out over George Town, where members can have breakfast, or meet for cocktails in the evening – it seems to be a great way to share experiences of the day. 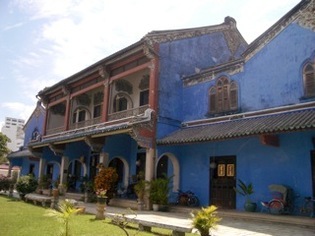 Sometimes referred to as the ‘Blue Mansion’ because of its striking blue-painted frontage, the Cheong Fatt Tze Mansion Hotel was once the grand home of a wealthy Chinese trader. With its decorative tessellated tiles on the floors, and the original long planks of granite set into the central courtyard still virtually intact, this luxury boutique hotel is a superbly restored example of a traditional Chinese courtyard house. This hotel won UNESCO’s Most Excellent Project in the Asian Pacific Heritage Awards in 2000. You can travel round the island of Penang in just one day, finding historic buildings, traditional batik painting, fishing villages, luxury resorts, tropical spice gardens and fruit farms – there is always more to discover. I return time and time again. In 2009 Penang was named one of the world’s 44 top travel destinations by the New York Times. Deborah Lavis is an Australian business woman who divides her time between Adelaide and Penang.